Welcome to our first Alaska Trip Achievers Blog Hop for October 2017 and thank you for joining. I'm excited to be participating. Those hopping today are Stampin' Up! demonstrators from all around the world that have achieved the prestigious Stampin' Up! incentive trip that only a limited number around the world achieve. We will be hopping together once a month to show you ideas and designs using current Stampin' Up! products. I love in the United States and would love to help you if you have any questions. I chose to showcase an AMAZING kit that is available in the holiday catalog and an alternate project that I made with it. The kit is called, Be Merry, and makes 12 rosettes. These rosettes are perfect as ornaments on the Christmas tree, an embellishment for a gift package or a gift bag. I chose though, to make a wreath! Here is a picture of the wreath I made. 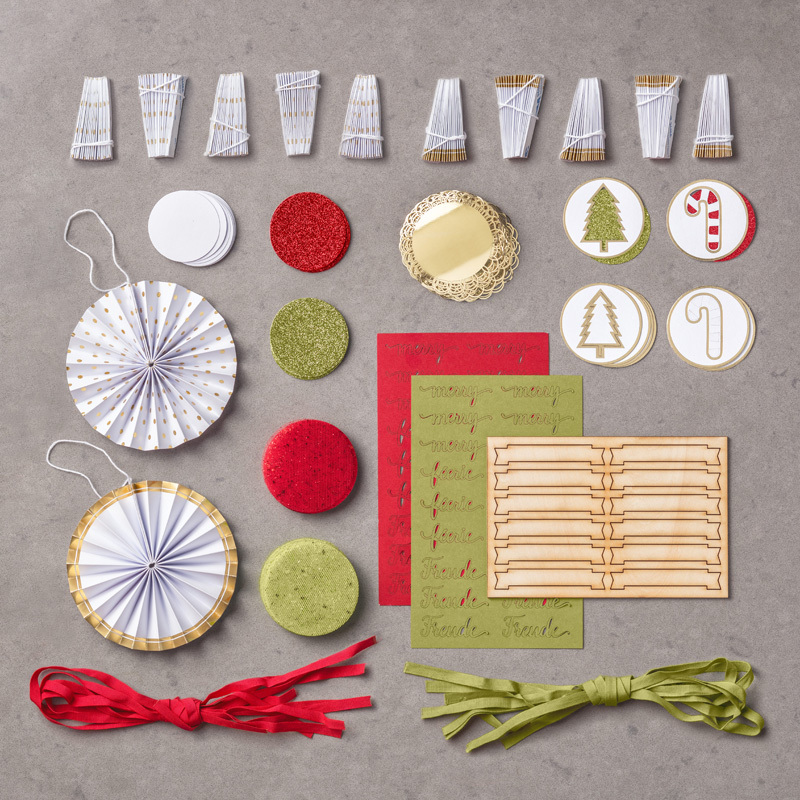 This kit is an all inclusive kit so it includes everything to make the rosettes except for adhesive and of course the wreath form. I pick up the wreath form from a local craft store. I then wrapped our burlap trim around it and topped it with 8 of the rosettes. I am going to use the other 4 of them for gift bags. Here is a picture of the contents of the kit. Here are some close up pictures of the rosettes. They are so pretty and sparkly. You may just be starting the blog hop here at my blog, Kim Vogel, or you may have come from the person previous to me on the list. If you get off track at any time, the full line-up below will help you move along from blog to blog so you see all the projects. At the moment you are visiting Kim Vogel. Here is a video that Stampin' Up! provided regarding the kit. Make sure you check it out! If you are interested in purchasing this kit, please click below and it will take you to my online store where you can purchase the kit, adhesives and burlap ribbon. I love the idea of making these into a wreath. Very festive!